Work on the mhorrigotii mech continues. Changed the marine head to a scion helmet and added a cowl with that distinctive widows peak that's becoming a signum for the mhorrigotii cultists. I'll add a few more wires, but apart from that he's starting to look pretty finished. The cowl thing is one of those ideas that's simple and yet genius at the same time. You've succeeded in creating a signature look that can be applied to virtually any model and instantly make it look like a part of this cult. Utter brilliance! 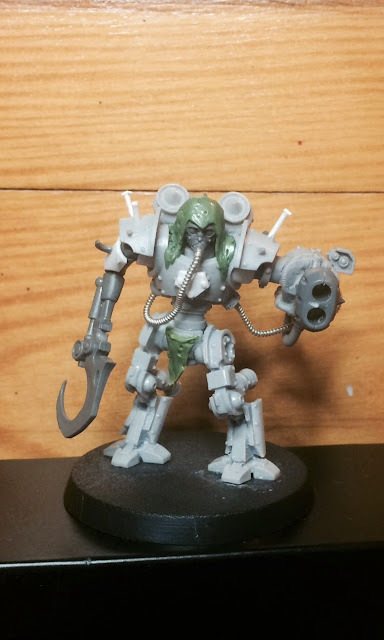 Forgeworld has some amazing models - especially the mechanicvm robot line.